Product code: ES8082 Categories: Sold Items, Sold Rings. Made over 100 years ago and still looking so beautiful and elegant, this 18ct carat gold antique sapphire and diamond ring was made in 1911 and has a very sweet engraving inside. Along with the hallmarks for being made in Chester in 1911, the inside of the band is also hand engraved with “E to G 1912“. If this ring could talk and let us know who these two sweethearts were it would add even more to the charm and romance of this ring. 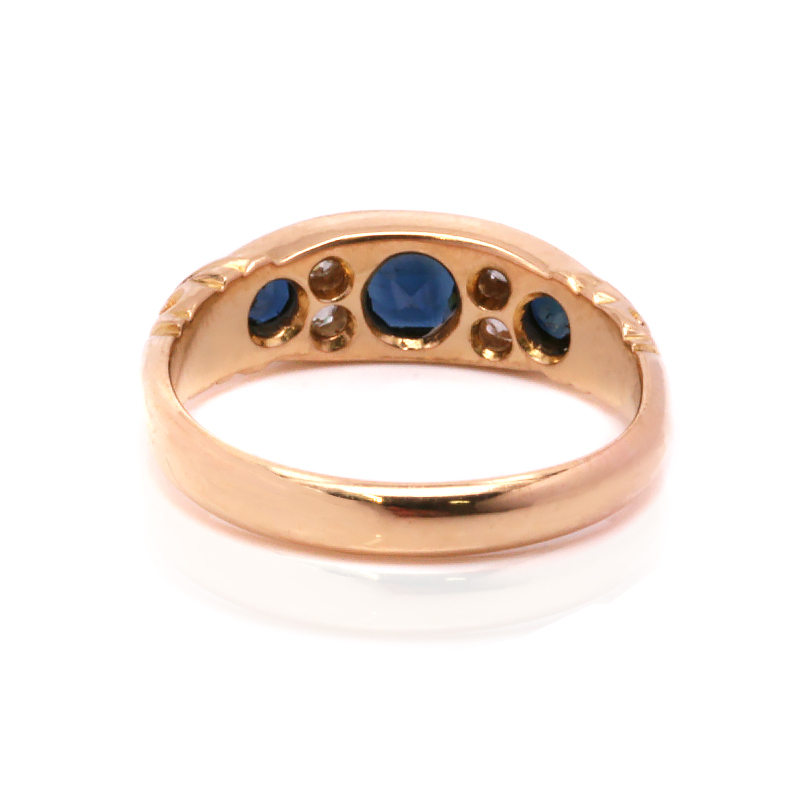 And the ring itself has a design that looks as fashionable today as when it was made over 100 years ago and is set with three lovely natural blue sapphires that total 0.88 carats. All matched perfectly in colour and transparency, they are highlighted by not one, but two diamonds on each side of the centre sapphire. These are the lovely early European cut diamonds and they total 0.16 carats and capture the light so well. Both the sapphires and diamonds are set lower into the band and the top of the ring measures 5.7mm wide at the centre by 16.1mm across and leads to the elegant band. Regardless of the finger this is worn on, it is a wonderful example of an antique ring that is not only so beautiful and but has a lovely sweet sentiment inside. 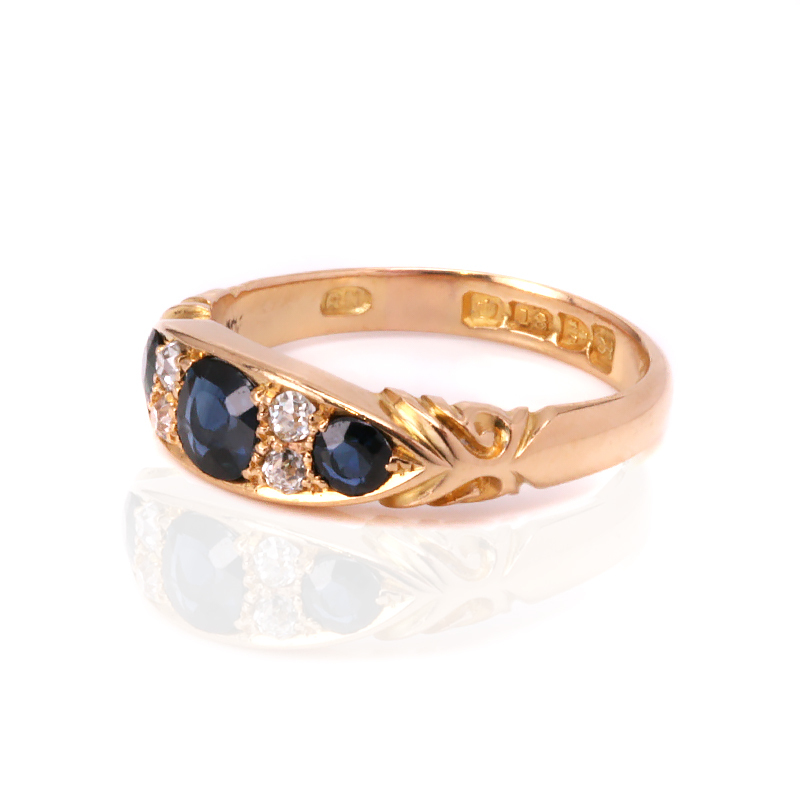 Tags: 18ct antique sapphire and diamond ring, Antique sapphire and diamond engagement ring. This ring would make a perfect example of an antique sapphire and diamond engagement ring. Set with antique European cut diamonds, this ring will always be admired for its beauty and elegance.